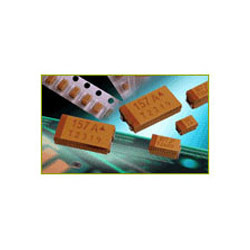 We trade in wide assortment of Chip Tantalum Capacitor that finds extensive application in various electronic devices. Manufactured by leading industries, these are produced employing latest technologies to ensure thats these products offers long lasting life cycle and superior performance. We provides a variety of RF devices on communication fields. These devices include Bluetooth/GPS/CMMB antennas, high pass/band pass/low pass filters, balance filters, balun transformers, antenna switch modules, etc. We provide a variety of high reliable and low ESR tantalum chip capacitors, covering a wide range of voltages. We do also few values of LOW ESR Tantalum caps. However make specific non stock parts can be supplied against your POs.